History: (Nick Fury, Agent of SHIELD II#36 (fb)) - Mia's father was an international currency exchange consultant who was secretly an agent of SHIELD, sent to infiltrate the Corporation. When Frank suffered a mental breakdown and became the Constrictor, Nick Fury informed Mia and her mother that he had died in a plane crash while on a business trip. 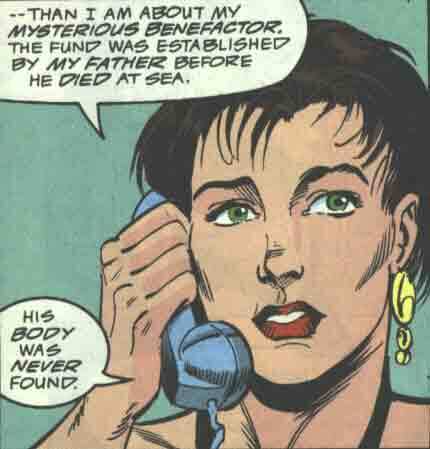 (Nick Fury, Agent of SHIELD II#36) - Years later, Mia was surprised to find several thousand dollars in her trust fund that could not be accounted for, and was in danger of severe fines from the I.R.S. She used her newfound fortune to hire Luke Cage to locate her mysterious benefactor for her. The benefactor turned out to be her father, who had wanted to provide for her using the money he had earned as a mercenary. Cage and Nick Fury offered the Constrictor a chance to return to his daughter, but he refused, wanting to keep Mia clean from his deeds. He told Cage to inform her that he missed her, and that "with a lot of hope, and a lot of praying," he'd be home soon. Comments: Created by Scott Lobdell, M.C. Wyman and Donald Hudson.